This year, suppressed frustration finally surfaced. It culminated in a movement run by women aimed at speaking out. Many sources of pain and humiliation have been shunned by indignant victims. Accounts of abuse have recently become the center of many important conversations. A particularly shocking case began sixteen months ago. An anonymous email was sent to the Indianapolis Star claiming that former USA Gymnastics and Michigan State University team doctor, Larry Nassar, was abusive in his medical practices. This email was later supported by more than 150 young female athletes who came forward with similar statements. Larry Nassar began his gymnastics career in 1986. He was the chief medical coordinator for USA Gymnastics in 1996, eventually attending three Olympic games in 2000, 2008, and 2012. In 2015, Nassar decided to retire from his position. The public remained in the dark and heard no justification for his abrupt choice. After a year of silence, reports began to surface citing Nassar as abuser of many young girls who would seek his medical treatment. These girls would trust Nassar as their doctor, especially as he was in the top medical position within the team. He would make them feel privileged for their position on international teams. “For years, Mr. Nassar convinced me that he was the only person who could help me recover from multiple serious injuries. To me, he was like a knight in shining armor,” said Alexis Moore. Moore claimed that Nassar molested her from the age of nine. Some of the most famous US Olympians have come forward with stories of their own abuse, including Aly Raisman, Gabby Douglas, McKayla Maroney, and Simone Biles. 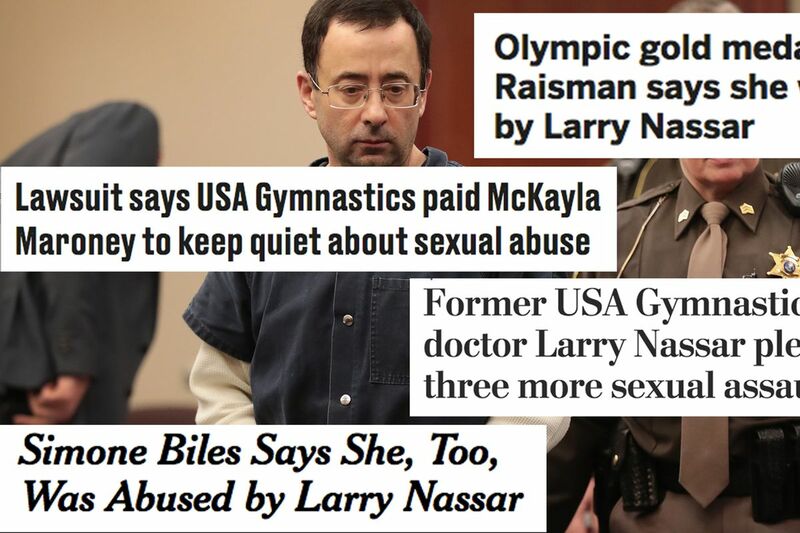 An even more shocking revelation was that USA Gymnastics, as well as Michigan State University, were aware of these scarring events, yet failed to take any action. Aly Raisman, an esteemed gymnast who has attended the Olympics several times, claimed an official with USA Gymnastics told her to feel lucky for the treatment she was receiving from Nassar as he was supposed to be such a ‘good doctor.’ Gymnasts reached settlements to prevent them from releasing their abuse to the public including McKayla Maroney. If she was to come forward, she would have been fined $100,000. For far too long, many young girls were forced to simply give in to silence and continue getting taken advantage of. Justice was finally served. Steve Penny, the CEO of USA Gymnastics, resigned in March 2017 as reports of the scandal increased. Michigan State’s athletics director Mark Hollis also subsequently retired. A sentence was delivered for a minimum of 40 years and maximum of 175 years in Michigan state prison for Nassar. With all of the new and empowering initiatives in place encouraging advocacy, we begin noting a change in our political climate. Many of the brave faces who have come forward to share their stories have created a sense of solidarity and community that has finally fostered a global climate where any form of sexual assault or abuse from those in power is no longer tolerated.